March 22, 2008—A New Invasion in San Miguel de Allende? I suppose it had to happen. More and more American franchises have been creeping into San Miguel. We've had a Blockbuster and Domino's Pizza for many years out on Ancha de San Antonio. Recently a McDonald's opened in the new La Luciernaga shopping center at the Queretaro entrance to town. But none of these are in the historic centro, the colonial heart of San Miguel. The only major US franchise that has set up shop in the centro is the Subway sandwich shop on Juarez, and reports are that it's not doing well. Too much competition from the Tortilan just down the block—cheaper sandwiches and, many say, better. 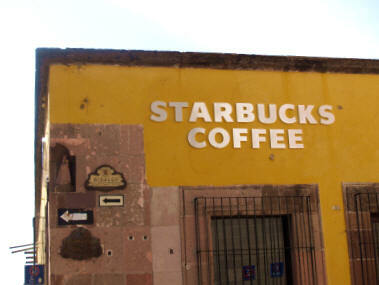 But now we have a Starbucks due to open this week right on the corner of the Jardín. Predictably, some people are upset, worrying that it will irrevocably change the character of San Miguel. Letters to the editor of Atención have been flying thick and fast, both for and against. I'm not one of the kneejerk fear-mongers, yelling that the sky will surely fall if Starbucks is allowed into town. And I think those who "blame" the Starbucks invasion on the presence of so many Americans here are either blind or terribly arrogant. We don't have that much power. Starbucks already has a solid presence in several Mexican cities and has announced that they will open 80 new stores in Mexico this year. And they are not designed to cater only to Americans. For many young Mexicans, drinking at Starbucks is a status symbol. Who are we to tell them they shouldn't want it? Still, I was upset this week when I saw the sign on the new store. It is HUGE! The individual silvery letters must be a foot high. There are no other signs this obtrusive in the centro. No way is this sign in keeping with the sign ordinances designed to maintain the colonial look of San Miguel de Allende. More grumbling has already been heard. Protests are being prepared. We can hope that the city administration reverses whatever special permission was given to Starbucks for this awkward and ugly infringement. Meanwhile, I think I'll continue to drink my coffee at Cafe del Jardín, Buen Cafe, Cafe Montenegro, Cafe on Correo, Cafe etc., La Buena Vida, Cafe Monet, Las Musas in Bellas Artes, La Finestra, or several other places that are locally owned, have great atmosphere, and don't burn the coffee. Yesterday was Good Friday, a really important day in San Miguel de Allende, and I'm still exhausted. I love the fact that the solemn religious processions of Semana Santa in San Miguel are not put on for the tourists. They are not about producing a show that will bring people to town. They are very real and deeply felt religious observations, traditions that go back centuries, and watching them is a perfect way to get inside San Miguel. You have only to watch, to look at the faces of the women carrying the heavy platforms bearing angels and saints, to peer into the eyes of the men wearing haircloth tunics and crowns of thorns and carrying heavy wooden crosses to know that the emotion you see there is not fake, not phonied up for the audience. It is real, and it involves a huge percentage of the community. The final procession yesterday—the Santo Intierno or Holy Burial—included about 2000 participants. The women who carried the female saints were dressed all in black, with black lace mantillas and white gloves—and many in 3-inch stilleto heels, despite the uneven cobblestones. The men were in black suits with purple sashes. The little girls were sweet angels all in white. Despite the fact that this is not a tourist show, it does draw thousands of spectators from all over Mexico and beyond. San Miguel is one of the few places in Mexico that has clung to these very old traditions, and many people come to see them. And that's why I'm exhausted. For me, this year's religious processions were all about the photographs. I have seen them many times but never seriously tried to photograph them. This year, I was determined to get some good shots and that meant getting to the best viewing spots early. My morning perch for the procession known as El Encuentro—the Encounter between Mary and her beaten and bloodied son—was in the atrium of the Parroquia, up against the iron fence—a good spot, except that it was in the sun, which meant almost three hours of standing in the heat. For the last hour, I perched my feet on an iron crossbar 12 inches off the ground, wrapped my arm around an upright and let that camera rip. Good photography, bad posture. I ended up with knees shaking. For the dusk procession, I thought I'd given myself plenty of time to get a spot facing the Oratorio church, where the procession begins. Wrong. All shady spots taken. I finally ended up sitting on the wall at the north side of the Parroquia—not a bad view but that cement wall got a little hard by the end of the third hour on it. I came home numb and bruised. But I got the shots. 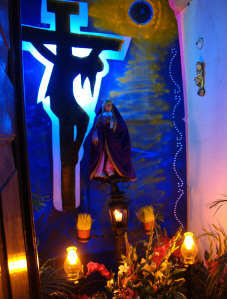 For more, check out the good Friday in San Miguel page. As I write this it is late Friday night—Viernes de Dolores, the Friday of Sorrows. 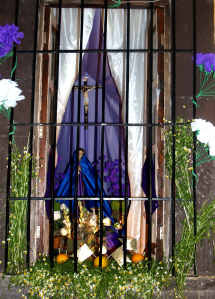 I've just returned from walking around town to see altars with images of the Virgin of Sorrows. The heady scent of incense, chamomile and lilies is still in my nose and the echo of holy music still sounds inside my head. And I can still taste the ice cream on my tongue. 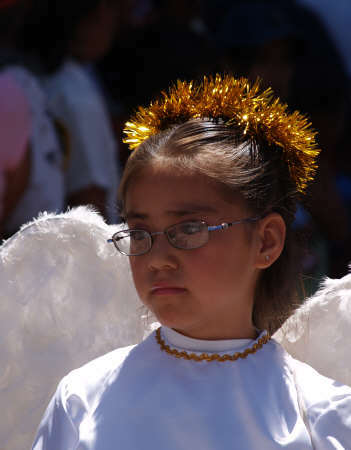 For this event that really begins Semana Santa, or Holy Week, in San Miguel de Allende, it's traditional for people to build altars to the Virgin of Sorrows in the windows of their homes, and to offer sweets to the passersby who come to see them. In the past, a sweet made from candied yams was the traditional offering, but today the emphasis has shifted to frozen treats and fruit water. I've just eaten two ice creams, a frozen fruit bar plus a couple glasses of limeade and jamaica, a wonderfully refreshing drink made from dried hibiscus blossoms. And I turned down half-a-dozen other offerings. The crowds on certain streets famous for the best altars were thick. Dozens of people strolled up and down Calle Barranca, which has many lovely altars. A large crowd stood quietly before the decorated fountain at Prolongación Aldama and Cardo. Just down Aldama, I counted nearly 100 people lined up at the Perez home to get a cup of ice cream then step inside to see the gorgeous room-sized altar, accompanied by lilting religious music. The statues have been in the Perez family for several generations. The altars showed not only great religious faith but wonderful creativity. Some featured painted backdrops and papier-mache boulders. One had a dramatically back-lit silhouette of Christ on the cross with his mourning mother below. The Almanza family altar on Tenerias included exquisitely carved and painted angels made my Señor Almanza, one of the most famous santeros, or saint-makers, in the region. There are dozens of these altars around town—in homes, in public spaces, and at nearly all of the 45 public fountains in San Miguel. Some are simple, with a few bitter oranges, some purple swagging, wheat grass and a picture of the Virgin. Others are incredibly elaborate, filling a room, or a courtyard, or a front garden, with several tiers, dozens of objects and complicated patterns created on the floor in colored sawdust and flower petals. But no matter how simple or how elaborate, no matter how long they took to create, they will all be gone tomorrow. 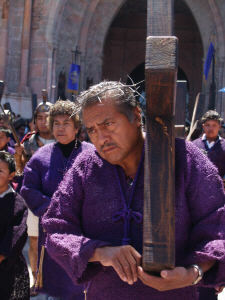 For a complete description of Viernes de Dolores, Friday of Sorrows, in San Miguel de Allende, visit the Easter in San Miguel de Allende pages. March 11, 2008—A Classic "San Miguel Afternoon"
I met friends for a late lunch and a really old friend—someone I hadn't seen in 10 years—was there too. This happens a lot in San Miguel de Allende. People come and go, but mostly they come back eventually. It was great talking over old times and catching up on the new over the delicious enchiladas verdes at El Buen Cafe, one of my favorite hang-outs. Kris bakes a mean Italian cream cake, too. Afterwards, I wandered up to the Jardín, ran into a couple more friends and sat on a bench awhile, just chatting and feeling the sunshine on our faces. Next stop was the Biblioteca, San Miguel's wonderful bi-lingual library, for coffee at Cafe Santa Ana. As I write this, I'm sitting on the patio (yes, they have WiFi at the library) sipping a cafe latte. People are lining up for the regular cinemateca movie at Teatro Santa Ana. Today they're showing Lost & Found in Mexico, a wonderful short film by Caren Cross about moving to San Miguel and rediscovering herself and her true life. A few feet away, in the brilliantly colorful Sala Quetzal, the San Miguel Community Choir is beginning a rehearsal with simple warm-up vocalizations, a pleasant accompaniment to my coffee. The Sala Quetzal is the library's main meeting room. Lectures, slideshows, kids' music classes—there's always something going on there. It also houses the library's stellar collection of books on Mexican history, art and craft and is decorated wall-to-wall, ceiling-to-floor with an amazing, brilliant, vivid and highly detailed mural by David Leonardo, that tells the story of Quetzalcoatl. Ah, here's a small bird—I don't know the name—hopping and hoping for crumbs. Water tinkles in the fountain behind me as the sun stripes a slow-moving line across my hammered copper table. The piercing pink/fuschia of a rioting bougainvillea is having its way with the rough stones of the 400-year-old abbey wall. Just down the steps, a group of Mexican teen-agers are gathered around a library table, ostensibly doing their homework but chattering and giggling and flirting in between working on their assignments. All around me, chatter echoes in English, Spanish, a smattering of French. Every few minutes, someone stops by my table to say hello, make a date, ask what I'm working on. You don't go to the biblioteca—or anywhere else really public—in San Miguel to avoid interruptions. Now the choir has begun to practice in earnest, a sweetly harmonized "Agnus Dei." The sun has passed on and the patio sits in cool shade. Time to wind this up, shut down the machine and head for home. I'll just finish with a line you hear constantly in San Miguel de Allende: Another perfect day in Paradise. I usually write glowing reports in this blog about San Miguel's beauty, charm, culture—all the magic and wonder here. Today, I was forcibly reminded of what I don't love about living in Mexico. I'm nearly out of gas--not the car kind, the cook dinner and heat water kind. Also, my internet connection is down. I called the gas company to come fill the tanque. "No problema, señora," said the chirpy receptionist. When a Mexican service person says "No problema," figure you're in trouble. She assured me the truck would come by three. I called the computer technician. Here's how my day panned out: Waited for the technician to call back. Waited for him to arrive. Nuked some leftover Chinese food. Let him in. Waited while he worked on the thing. He left to take the modem to the cable company. Waited for him to return. Ate a cookie. Waited while he worked some more then said the cable guys had to come. Paid him. Waited for his call back. Meanwhile, waited for the gas truck. The technician called, said the cable guy would come tomorrow morning. Sighed. Cancelled tomorrow's other appointments. Waited for the gas truck some more. By six, I figured it was safe to go out. Clearly no truck was coming today. Tomorrow I'll stay home and wait some more. This is a pretty typical scenario for getting anything fixed/filled in San Miguel. Customer service is still a new—and often foreign—concept in Mexico. There is a point to all this rambling, and it's this.... This is Mexico. They do things differently here. For anyone contemplating a move to San Miguel, it's very important to understand this. If you expect things to work like they do "at home," you're bound to be often frustrated, disappointed and annoyed. If you complain to those you think have failed you, they'll be made to feel ashamed, to "lose face," and you will have committed an unforgiveable cultural faux pas. There's a useful phrase in Spanish that you should memorize your first day here. Ni modo translates as "Nothing to be done," or "No matter." What it really means (said with a shrug) is "Oh well." It encompasses a whole list of Mexican philosophical realities: Disappointment is inevitable in life; things happen in their own time; it's no one's fault. All in all, not a bad way to go through life, shrugging off disappointment and simply planning for another day. So when the more frustrating side of living in San Miguel slaps you upside the head—and it will—shrug it off, say, Ni modo, and look out at the jubilantly blooming jacarandas, enjoy the killer sunset, remember your many friends. Remind yourself how lucky you are to live here. While surfing the internet today, I happened to come across a site with some of the most gorgeous photographs of San Miguel de Allende I've ever seen. It's the "Juarde" site. So what, you ask, is "Juarde." The short definition is that it's the ex-pat phone book for San Miguel. The name is a play on words. Pronounce it like Spanish and you get "Hoo-are-day," which sounds a lot like the English "Who Are They?" The directory of names, addresses and phone numbers has been around for many years. Since there was no reliable San Miguel phone book (there still isn't), the originators came up with the idea of making their own list of foreign residents. It's been published every year since, well over 20 years, and now includes both Mexican and foreign residents. Juarde is not complete—you have to actually tell them to put you in and give them your correct contact information—but it's your best chance at finding that elusive phone number for your uncle's neighbor's daughter's girlfriend who moved to San Miguel two years ago. Juarde has recently started a website with plans to put the directory on line. There's not a lot on the site yet, but.... When you go to their home page, you'll be greeted with a slide show of dozens and dozens of changing photos by Maximillian Monroy and they are works of art. People, crumbling walls, reflections in the curved chrome of a car, a dog in a window—the images are striking, beautifully composed, full of richly saturated color. They truly capture the essence, the visual magic of San Miguel de Allende. Be warned... don't click on the link below if you only have a minute. You'll be sitting there mesmerized by the photos for probably half an hour or more. How many of the locations can you recognize?